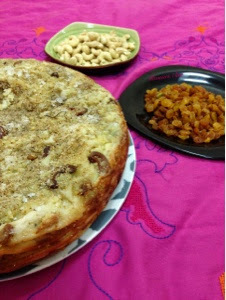 Chatti Pathiri is a very common sweet dish among Malabar Muslims. This is a must for any get together in our area. 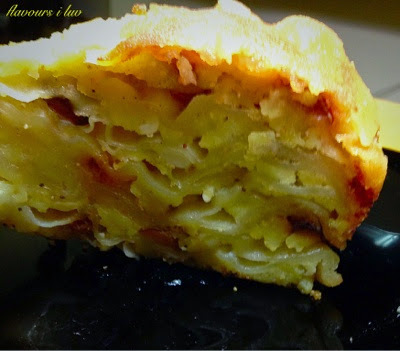 It is made in both sweet and savory variations. This is a little time consuming recipe but really tasty and delicious. You can bake this in oven or cook on stove top. I prefer stove cooking rather than oven. 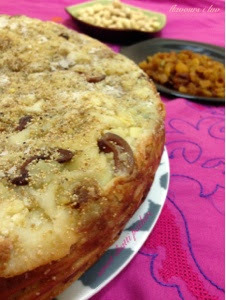 We can make the Pathiri either like the chappathi dough, rolling it and then cooking on the tawa/griddle or making batter, by mixing maida (plain flour), water egg and salt and making thin pancakes. I made the batter version because it is so soft and easier. 1. Mix the flour, egg and salt with enough water to make a thin batter. 2. 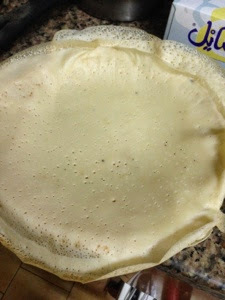 Make thin pan cakes (dosas) in a non stick pan. You can vary the size of the pan cakes depending on the size of the vessel in which you are making chatti pathiri. 1. Beat the eggs lightly with sugar and cardamom. 2. Heat a large frying pan. 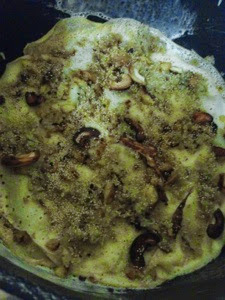 Add ghee and saute raisins, cashew nuts, poppy seeds and grated coconut until they start to change the color slightly. 3. Add the beaten egg and scrample the whole mixture until the egg is well cooked. Keep it aside. 1. For coating, beat the eggs, sugar and cardamom and keep aside. 2. Take a non-stick vessel or baking tray, spread ghee all around. 3. Take one pan cake, dip in the egg coating mixture and keep it as the first layer. 4. Sprinkle the scrambled egg filling on top of the pan cake. 5. Dip the second pan cake in the egg coating mixture, and place it on top of the filling. 6. Sprinkle the scrambled egg mixture again and repeat this until all the pan cakes and the scrambled egg mixture is used up. Pour the remaining egg mixture on top so that it drains on all the gaps on sides and form a thin layer on top. This is important to keep chatti pathiri moist. 7. Bake in oven for about 15 minutes or until the top of pathiri turns golden. You can cook it in a non-stick vessel on stove, by placing it in very low flame and then flipping it over carefully and cooking on the other side.